A Community Unlike Any Other. Lake Nona is a place that inspires human potential by prioritizing wellbeing, education and community. Lake Nona offers a wide-variety of entertainment, leisure and learning activities for when you’re not on the court. 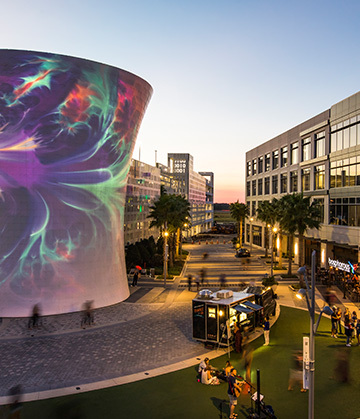 At the heart of Lake Nona’s Town Center stands “The Beacon and Code Wall.” The Beacon is a six-story landmark that comes to life at night with a visual experience of video, music and interactive elements. Alongside stands Code Wall, an installation of specialized dichroic glass with imagery and messages written in binary code. At night, The Beacon comes to life with a visual experience of video, music and interactive elements. Code Wall serves as a parking area and an interactive piece of visual art. For a fun learning experience, we invite visitors to interpret the binary code written in its dichroic glass while you’re here: simply look for the plaques that will assist you to read the binary around the wall. In the code, you’ll learn about the vision and purpose of Lake Nona—a community built to inspire. 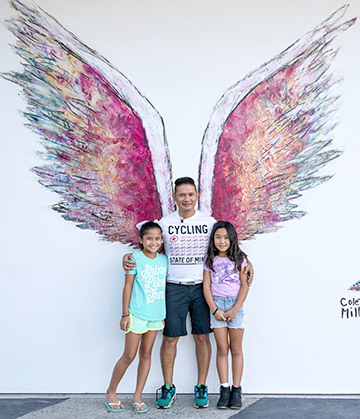 Colette Miller created the Global Angel Wings Project in 2012, in the streets of Los Angeles, the City of Angels. They were painted to remind humanity that we are the angels of this earth. They are human sized interactive public art, wings that people take photos with and thus become part of the artwork. The first pair was just street art but the response was natural, immediate, and spontaneous - from people of all sorts and backgrounds. Colette has painted wings globally - Kenya, Australia, England, Japan, Taiwan, France, Cuba, Juarez Mexico and more, and right here in Lake Nona. 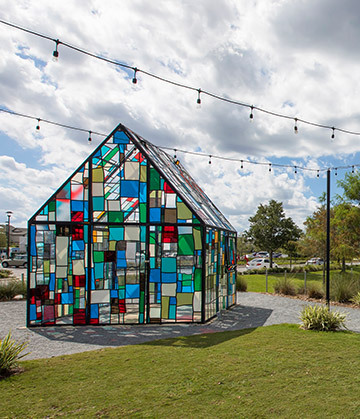 Situated in Laureate Park near Canvas Market is “Glass House,” a stunning work of installation art conceived and constructed by Brooklyn-based artist Tom Fruin. This is one piece in Fruin’s ongoing ICON Series, which has included pieces installed in Brooklyn, NY and across Europe. Each work in the series is site-specific and monumental, and “Glass House” is no different. It utilizes reclaimed materials and pulls cues from sustainable urban design and American folk art, all while eliciting the spiritual qualities of stained glass. 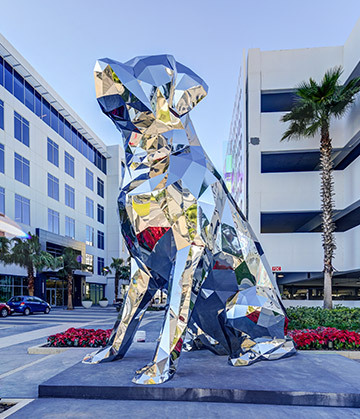 The 35-foot, 3,100-pound stainless steel installation modeled after a Labrador Retriever welcomes residents and guests as they enter Town Center. The fractal, reflective surface replicates the water of the community’s namesake – Lake Nona. 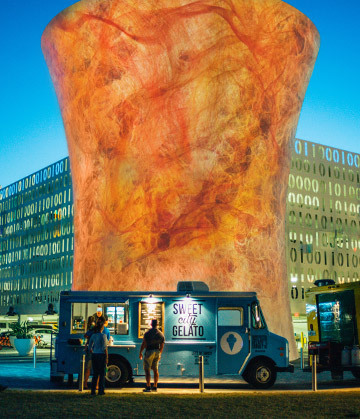 Fusion is a sculpture by Lake Nona public artist JERFE. The piece is located on the exterior lounge of Chroma Modern Bar + Kitchen, which harnesses its inspiration from the restaurant’s colorful small plate menu and serves as an artistic extension of The Beacon. With over 700 events each year, Lake Nona is one of the most programmed communities in America. From live music and local produce to community yoga sessions, there are always events happening in the community. Head to Town Center these fun weekly and monthly community events. Enjoy live music, a variety of food trucks, family-friendly films and more. The heart of the community, Lake Nona Town Center was designed with discovery and great times in mind. Admire the iconic artistic structures, The Beacon and Code Wall. Grab a coffee, enjoy a movie under the stars, or try something deliciously different at one of many specialty restaurants. The newest park in Lake Nona includes a floating Aqua Park, Cable Park for wakeboarding/water skiing, one-of-a-kind 60-foot climbing tower and ropes course— something for all ages. Getting around town while enjoying the great outdoors. Our paved trails make it easy to travel from neighborhood to neighborhood, but if you want to get closer to nature, bike or hike the acres of preserved green space along our unpaved trails. Gather for some fun, whether you’re playing games, hitting long drives with no walking in between, or sharing light bites and laughs with family and friends on the rooftop, in the game lounge or in one of the bays. 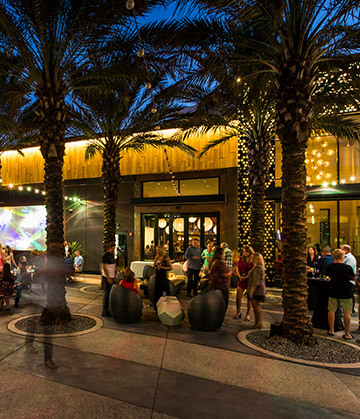 An outdoor gathering place in Lake Nona Town Center, Boxi Park is a family-friendly place to play, with counter-service restaurants and menus created by world-class chefs. Open Thursday and Friday at 4:00 pm, Saturday and Sunday at 11:00 am. Just as Lake Nona prides itself on keeping up with leading-edge living and community development, this goal carries through to our dining options. Here, visitors and residents can enjoy a quick bite to eat or experience some of the best cuisine in Central Florida. Open seven days a week, the self-service Net Post Grill features a variety of grill favorites, international fare, and healthy options and is a gathering place for happy hours, live music, and themed events. More than fresh, authentic Turkish cuisine, Bosphorous is an experience for the senses. Step inside to original Turkish paintings, warm colors, silk carpets, and flavorful aromas. Enjoy small plates with big tastes in a place designed to connect and unwind. Located at the cornerstone of Lake Nona Town Center, dine inside or outside, near The Beacon and Code Wall. Here’s the place for delicious, wood-fired pizza paired with tasty beer brewed in house. Be sure to get a close look at the state-of-the-art brewing systems through the glass walls. Located in Jacq & Jack, a full-service salon, here is the place to get your fresh-brewed caffeine fix, complimentary when you book a service. Enjoy new American cuisine influenced by Florida’s Southern and Latin American roots, all with plenty of fresh-caught Florida seafood and local produce—and picturesque waterfront views. Relaxed and casual, satisfy your cravings with everything from mouth-watering baby back ribs and juicy hamburgers to fajitas with all the trimmings. A great Lake Nona restaurant—enjoy an authentic hibachi, sushi, and Omakase dining experience crafted from fine seafood imported from Japan and high-quality produce sourced from local farms. When fresh seafood meets the flavors of authentic Mexican cuisine, the result is pure deliciousness that’s naturally healthy. Be sure to try Rubio’s award-winning fish tacos or inventive burritos. For coffee crafted just the way you like it and a selection of decaf favorites and fresh bakery treats, anytime is a good time for a Starbucks run. With the feel of a neighborhood tavern and the elegance of an upscale restaurant, enjoy modern American cuisine ranging from craft beers and award-winning burgers to flavorful seafood and your choice of fine wines. For barbeque at its very best, make your way to Pig Floyd’s, featuring oakwood-smoked ribs, brisket, pulled pork, chicken and more—all served sauces ranging from sweet to ultra-spicy.